Inspiration always hits me at unpredictable times. I have been feeling a bit morose lately, like life is happening outside my window and all I can do is sit and watch. I know that this feeling is stemming from new plan to get healthy. A plan that means lots of rest, no alcohol and following a specific diet which is hard to get at restaurants. My lifestyle up until now has pretty much revolved around going to nice restaurants and drinking wine – of course, that was never the main focus. The focus has been getting together with great friends and sharing the experience. So, as you can imagine that the transition has been a bit rough for me. Don’t get me wrong, I definitely feel “healthier” and I’m happy I’m doing this. Am I putting my life on hold OR is this simply a transition period? OR is this my “new life”? This morning, on “walkie”, Lucy and I ran into one of her favorite people friends, a woman named Susan. Susan usually walks with two other women and I have always really admired them. I always felt like they are a trio who I’d really enjoy sharing a bottle of wine with (old life, of course!) I am guessing that they are in their late 50s or maybe early 60s and seem to have a really geniune friendship with each other. They walk every single day and they walk long & far… I didn’t know how far until today. Anyhoo, Susan was on her own today and happened to be turning around so we walked together for a good 1/2 mile. Our conversation was very much like conversations I have with my own fabulous girlfriends. We covered topics like how we each ended up living in the SF Bay area, family, life in general. She (of course) asked if I had kids and her response, “it will happen when it is meant to.” Love that! That 1/2 walk disappeared quickly and I wished I could blow off work and continue walking with her. At one point I asked her how long she walks and she said, “I walk for 4 1/2 hours” !!?!?! Wow. She’s in fantastic shape, but I would have guessed that she and her friends walk more in the range of 4 1/2 miles. Lucy and I are slackers in comparison! I am truly inspired… and a bit humbled. 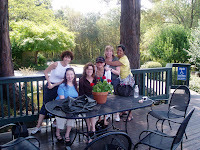 I am very fortunate to have a group of wonderful women in my life. I can’t imagine life without them. I went away with such a group of gals this past weekend. For me, hanging with my girlfriends is a healthy endeavor, almost therapeutic… not unlike doing a yoga session or going for a long walk. It’s a chance to stretch my heart and mind with people who understand and share the value that girlfriends bring to one’s life. I am free to be myself with these women. We may not share the same opinions or perspectives on everything, but we accept each other’s uniqueness. Often, our discussions give us the opportunity to learn about life lessons, topics or events that don’t apply today but may apply someday. I’m ready to plan our next getaway… Mexico? Half Moon Bay? No matter where we decide to go, there is no doubt we will have a great time. First off, this is a picture of me & my family celebrating a belated Father’s Day. 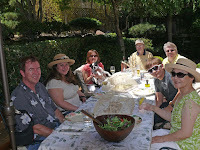 We feasted on homemade breadsticks, salad, grilled asparagus & cauliflower and baked pork tenderloins. Dessert was a refreshing, cool, smooth vanilla flavored panna cotta with fresh mint and raspberry puree as a sauce. My mom is amazing. The reality is she could fry up some plastic forks and it would be delicious. I forget how great my nephew is. I miss him and hope we can have him over for a long weekend sometime soon. He’s 13 years old and just plain fun. We played “telephone” and his word/phrase was, “Mytosis Green” — we all thought he said “my toes are green”. It’s been a while but here’s my one thoughtful comment for the day… This is something that has actually been bugging me for a while. Okay, you probably recognize that I do love to blog, when I’m in town. For me, it’s a rather therapeutic way to process the random thoughts that run through my haphazard mind. You’d agree that blogging is like an online diary. But what if you feel a STRONG need to blog (vent, gossip, criticize, talk smack about, etc) someone or some people that you know are regular readers of your blog? You just can’t – unless you are willing to have your family disown you. Oops, did I give it away? Anyhoo, that is why I would really love to find a blog medium that allows you to create multi-tiered access levels: a ridiculously small set of friends or lovers would have access to everything, friends/FAMILY would have access to certain juicy posts, and the general public would have access to the most mundane and bland of the posts. I would feel a lot more free to speak my mind truly and freely (to the privileged few of course). I have yet to find such a tool. Hell, I might actually pay for such a product! So… you software developers out there, get to work. And then when you are done, let me know, so I can sell your product to others. yeah, any chance to work it… I will! I make darn sure I enjoy every weekend… every moment of the two days off of work are precious to me. I am lucky enough to have wonderful people (and canines!) in my life to help make weekends enjoyable. I made a realization this weekend… there is nothing more valuable than best girlfriends who you can just BE with, trust, and never feel the concern of offending them. There is no pretense, no judgment, no posturing… Just appreciation, understanding and respect for each other. We appreciate our similarities as well as our differences. If one is having a problem, we try to lend and ear, offer consolation and suggest solutions. There is no bravado or jealousy, even though one of us might be in a better position financially or more successful personally or careerwise. Icing on the cake is a friend who you can have fun with and laugh with. It is rare to find people in this world who you can develop such a relationship with. Let’s face it, you aren’t necessarily going to have this type of relationship with family members. Here’s to great friends… I feel blessed to have them in my life!